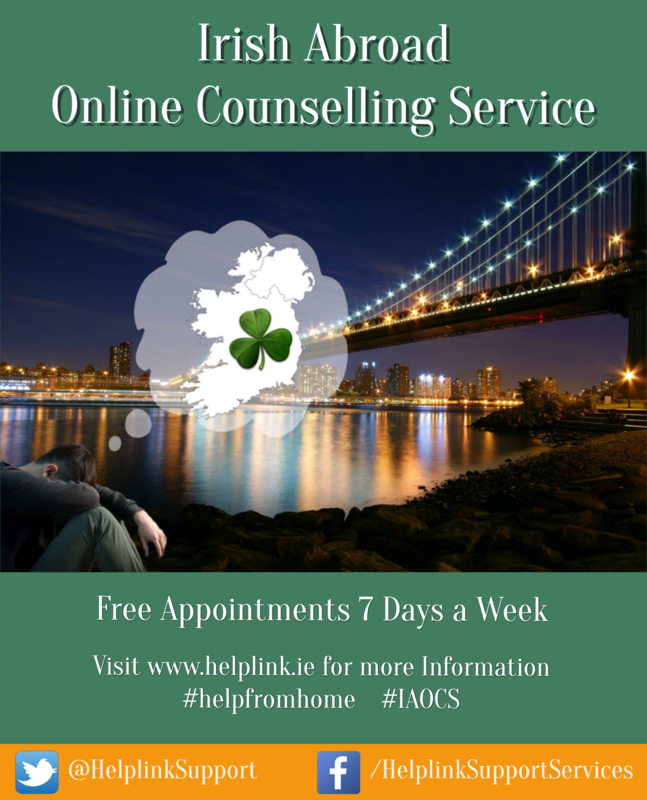 Irish Abroad Online Counselling Service (IAOCS) – supporting Irish citizens living abroad with their emotional support needs 7 days a week! This service is also available for returning Irish emigrants – must register for appointment within 3 months of return. From listening to the needs of our clients’ through their stories and analysing current and previous research, we have found that Diaspora (emigrants) are very unlikely to make use of counselling services in their adopted country of residence. Those who attempt to engage report barriers experienced with culturally unaware counsellors making the counselling process more difficult among other aspects. Examples of these stories that are reflected in decades of multi-cultural counselling research are available here: ‘Research Links‘; for more on this topic please see our ‘identified need‘ page. With the assistance of the Department of Foreign Affairs and Trade and the support of the GAA and An Post, Helplink launched our free online counselling service on September 10th 2016; initially for Irish citizens in Australia and in Canada. In 2018 appointments for this much needed service became available for Irish citizens across the globe (time zone dependent). This is a free service for Irish citizens living abroad and now, since 2019, Irish citizens can also avail of the service when they are returning to Ireland. For Irish returning emigrants they can self-refer directly to us or they can also go through our referral partners Crosscare Migrant Project, Safe Home Ireland and the Irish Council for Prisoners Overseas – click on the links to go to their websites. Click here to go to our ‘Frequently Asked Questions (FAQs) page‘ to see how! People are free to refer themselves by going to the contact page on this website and emailing us with your name and location. You can also be referred through any Irish support organisation, Irish Embassy and/or Consulate. In order for us to continue to bring this free service to all Irish citizens abroad, we need sponsorship/funding from; individuals who are interested in helping their fellow citizens abroad, from organisations that support the Irish abroad and from Irish owned companies at home and abroad. Please note: These services are NOT crisis services.